I say it a lot: Emerging neighbourhoods begin when a neighbourhood's local main street opens an indie coffee shop. You may think: "Big deal. What's so special about a coffee shop any way? What does that have to do with residential real estate? I don't even like coffee." You don't have to like coffee to know how real estate can be effected by a simple coffee shop. When a neighbourhood begins to change, one of the first signs that it may be an emerging neighbourhood is the elusive coffee shop. Take Supercoffee in Mount Dennis. This new neighbourhood coffeeshop does not shy away from telling us its intentions. On its web page mission statement, Supercoffee owners state: "We aim to be a neighbourhood hub, to provide space and inspiration for exciting cultural activity and social change. We welcome partnerships and collaborations with local residents, organization, businesses, nature lovers, trouble makers and instigators." Wow. I understand they sell coffee too! Mount Dennis has historically and notoriously been a depressed, not-too-transit friendly area that has recently attracted a number of first time buyers because of the low prices in comparison with the rest of Toronto. And when I saw Supercoffee at the corner of Weston Road and Eglinton, I knew this 'hood was ready for some change. But why an indie coffee shop? Why not a hardware store? Or an appliance shop? I mean, one of the most successful, long-standing Mount Dennis businesses, Caplan's, sells appliances in Mount Dennis, just up the street from Supercoffee. Why is that not a sign of neighbhourhood success? Well, the coffee shop is often opened by independent business owners who live in the area, though not always. 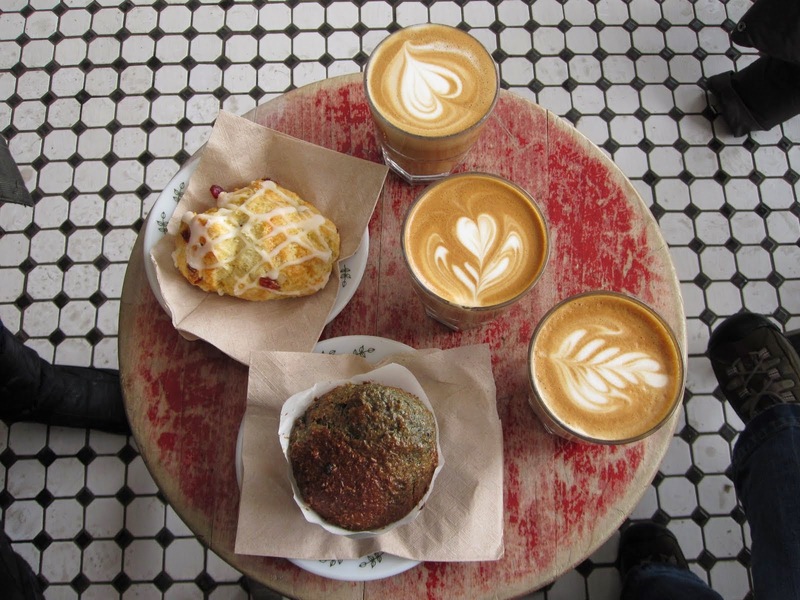 New, independent coffee shops tend to function as a place for new folks to go. When you're new to a neighbourhood you may seek out something new yourself. You share that fresh-to-the neighbourhood connection. Also, coffee shops often lead to people talking about the neighbourhood. And if there is a focal point, a spot to gather together in a casual manner, then coffee shops do it best. It's the place where people will offer other neighbourhood services like music lessons or renovation services. It can function almost like a community centre. Caffeine gets the conversation going. The new coffee shop brings in and connects the newcomers who want to be a part of the community. They encourage community gatherings and form stronger lobby groups and business improvement associations. Places like Caplan's, although serving a great purpose, does not build community. Many, come from out of the neighbourhood to go to Caplan's to buy appliances at a reasonable price. It's not necessarily local clientele. Supercoffee is likely almost all local folk. Now to be clear, not all coffee shops apply here. Starbucks usually comes along later in the gentrification process. Take its entry into Leslieville in 2006. It was a way of saying the neighbourhood has arrived, even if you're not a fan of corporate warriors like Starbucks. Why? Because Starbucks does their research and does not land in just any old neighbourhood. Their business model is to invest in neighbourhoods on the upswing with a clientele who has the disposable cash for pricier coffees. So, if they're there, Starbucks have heavily weighed their options, and expressed great faith in your neighbourhood. I don't know if the same can be said for Tim Horton's, Canada's non-Canadian, reasonably priced coffee and more store. Their business model looks to work on convenience, not neighbourhood. It appeals to those driving by, not local per se. So, if you're looking to invest in an early emerging neighbourhood on the upswing, keep an eye out for the local indie coffeeshop. In some advanced emerging neighbourhoods you may find 3 or 4 coffeeshops packed close together. Take the Junction. There's Locomotive, Starbucks, The Good Neighbour and Crema all within one block. In a brand new emerging neighbourhood, it may be the first to arrive. It doesn't mean that that the neighbourhood will change into the trendiest place in the world within months, but it is a starting point and a good sign. The top notch restaurants, yogas studios, better schools, doggie daycare and microbrewery pubs may follow. Coffee shops is where it starts. For some, it could mean that this gentrification process displaces the poor or disenfranchised longstanding residents. It can, however, be argued that the improvement in a neighbourhood - more community based activities, safer streets, more business options, positive real estate price appreciation - can benefit many of the locals - old and new.